Royal Leamington Spa (or Leamington Spa) is a town in Warwickshire, UK. In 2001 it had a population of 45,300. Until 1784 it was not a town but a village. It was in this year that two local men called Benjamin Satchwell and William Abbott discovered a spring in the village. The two men, and others from the town, began to use the water for treatment of illnesses, which was a common practice in those times. The town quickly developed into a spa town with many rich people visiting to 'take the waters'. Because of this the town grew quickly. The town soon became famous and a popular holiday resort. When spa water stopped being fashionable fewer people came on holiday to the town, but rich people still went to live there when they were old. In modern times Leamington does not treat many people with the water but it is still known as a pleasant place to live. It is also popular for shopping. The town is built by a river called the River Leam which flows through the middle of the town from east to west. The town is now connected to another town called Warwick. Other nearby settlements include Kenilworth (about six miles away), Rugby (about sixteen miles away) and Coventry (about ten miles away). 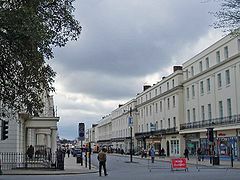 The Parade and surrounding streets feature large Regency town houses typically with white façades, sash windows and high ceilings. Most of the buildings in the centre are listed. This page was last changed on 13 February 2017, at 15:50.